All I wanted to do at my sister’s wedding last fall was go look through the trash. I had a great time, but I couldn’t stop thinking about what was happening back in the kitchen. After we sent the newlyweds off with sparklers in the parking lot I ditched my jacket, rolled up my sleeves, put on a pair of gloves and dug in. The caterers had billed themselves as “sustainable,” so I was surprised to see their trashcan overflowing with plenty of things that weren’t trash. The first tip was a brand new white kitchen towel. Knowing that my dad—a painting contractor—always needs rags, I set it aside to wash for reuse. Then I found another. And another. They just kept coming. As family and friends periodically came to see what I was doing their looks evolved from confusion to a bit of shock. Within a few minutes of sorting I pulled out more than two dozen new towels, stacks of compostable dishware and cutlery, multiple pieces of cardboard, aluminum foil, a few bottles, and a weird amount of energy drink cans for such a small crew. This was from one kitchen trash can at a simple buffet wedding for less than 40 people. The only reason I knew it would be worthwhile to get up to my elbows in trash was that as a sanitation captain for one of the largest catering companies in New York I had seen so much worse. Compared to turning off the lights or using less water it can be hard to explain the environmental effects of our trash habits. Yet throwing stuff away—and yes sometimes recycling it too—is one of the most universally selfish things we all do. We often care a lot more about where stuff comes from than where it ends up. For many of my years in the service industry I paid little attention to what went into the trash bags I was carrying. Until I became a “sanit” captain, and eventually a reporter on the trash beat, I had no idea where it was all going. During more than three years on the sanit crew I hauled trash through the bowels of the city’s biggest landmarks for some of its most high-profile residents. Whether it was a board meeting for a dozen people, a wedding for hundreds, or a festival for thousands, some amount of waste was always inevitable. Some was also preventable. If clients were willing to pay enough we would make sure they had whatever they wanted, no matter how impractical or profligate. Sometimes it seemed like the richer the client or the more noble the cause, the more waste we created in the process. "Everyone liked to say they cared about recycling and wasting less. Few wanted to take responsibility for it." On most shifts I easily sorted and carried more waste than the average person generates in months. Depending on where we were working, a big event could create enough trash to overtake long stretches of curb, fill up loading docks, or crest over the sides of large roll-off dumpsters. 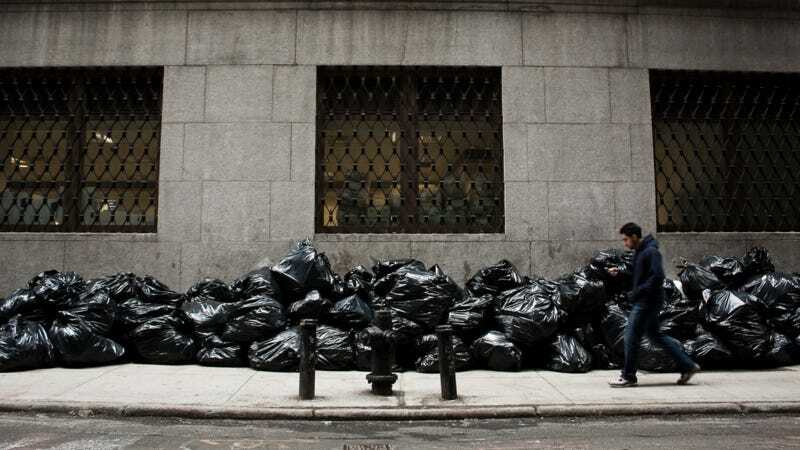 Estimates vary due to the complexity of New York’s waste system, but the city conservatively piles up at least 10,000 pounds of commercial trash per day. Every shift was a little different, though the trash flowing out the back of the average catered event follows a similar rhythm. Through sticking my bare hands into countless bags I came to know it well. First would come the lighter, drier stuff from set-up: plastic wrap, polystyrene packing foam, cardboard boxes. Once the event got started the cocktail napkins, bottles, and cans would trickle in, followed by successive waves of lukewarm food to be scraped from plates and emptied from kitchen trash cans. As the event wound down there would be more bottles, more food, broken glass, and some unwieldy flower arrangements or decorations. Tubs of slop—a mixture of leftover drinks and other mystery liquids—had to be dumped at the end of the night. Fistfuls of lemons, olives, and soggy napkins had to be pulled out of the drain after. The real nasty surprises would usually come at the very end—a trashcan loaded with oyster shells or raw hamburger meat, five-gallon buckets of oily sauce, grills full of scalding charcoal, fryers brimming with sizzling oil. And, all too often and especially at buffet events, there were the stacks of aluminum trays filled with perfectly good cooked food. Despite some protections under the Good Samaritan Donation Act, the safety factors involved with recovering food from these settings can make it complicated. Recovery organizations do a lot, and my company did work with them on larger jobs, but it can be tough to coordinate pick-ups on such a large, random scale. Even in states with commercial food waste bans food recovery groups are still fighting to be seen as the first choice before composting. Whatever food we couldn’t reuse or feed to the staff had to go one way or another by the end of the night. Sometimes this was as simple as wheeling the bags away in some kind of cart or loading them into a service elevator. Other times it meant hauling them down flights of stairs, into dark alleys, across streets or through fields in about every type of weather imaginable. On a busy day our company could be doing at least 10 events throughout the city and we were one of dozens of caterers. Just about every day someone wanted to host a corporate meeting, movie premiere, auction, concert, fundraiser, birthday, wedding, awards ceremony, conference, office party, sports tournament, or sometimes an inauguration. There was trash piling up after every one of them. I eventually got used to dealing with the trash. I still didn’t understand what was happening to it. The city’s commercial recycling rules have since changed to align with residential rules, but they used to be different depending on where we went, and a lot of times what we sorted for recycling was still ending up in the same dumpster as everything else. Certain museums were stringent with their recycling rules, while office buildings or banquet halls weren’t. We could separate waste food for composting at the mayor’s mansion, but not at some of the city’s biggest parks. At first it was easier to take this chaotic system as a license to not care, and I’ll fully admit to throwing hundreds if not thousands of pounds of good material out. It took the urging of certain co-workers to change that. Sometimes they shared a vague sense of guilt for not recycling. Other times they showed me how it could be done more efficiently. I started to feel more obligation to make this happen whenever possible and became more curious about why it mattered. In many ways it started with an article I did about plans for a new sanitation garage in Manhattan based on a tip from a neighborhood activist. This led to reading books on the evolution of New York’s solid waste management system—the country’s most complicated—and later covering it while in journalism school. I started talking to the people who decided what happened to our trash, visited the places where it went, and met the people who brought it there. Now I was spending my days scoping out transfer stations in the South Bronx and attending City Council hearings to figure out why this was all so expensive. When Mayor Bill de Blasio announced plans for an ambitious new “zero waste” future I knew I was on to something. At one point I even got asked to come discuss an investigative series I wrote on the city’s top local news channel. "Getting the average resident to buy less and recycle more would be hard enough. Getting fast-paced restaurants and catering companies to do it would be that much harder." On nights and weekends I was still working sanit at benefit dinners for more charities than I knew existed and weddings that cost far more than my own. My company did try to separate recyclables and organic waste for composting, to varying degrees of success, but the nature of our work didn’t make it easy. Each event gave me new proof of how tough this “zero waste” future would be to achieve. Getting the average resident to buy less and recycle more would be hard enough. Getting fast-paced restaurants and catering companies to do it would be that much harder. New York has always struggled to manage its waste and the system has only gotten more expensive since the city’s last landfill closed back in 2001. About 17% of the city’s residential trash—and an unknown amount of its commercial trash—is currently being recycled. Habits are difficult to break and the appetite for building any new facilities within city limits that might help make the process more sustainable or cost-effective is very low. As I kept meeting people throughout the five boroughs with some connection to this vast waste ecosystem, I realized that changing daily recycling behavior was the easy part compared to what really needed to happen. The bigger issue was changing our collective societal entitlement to wasting things in the first place. Some of the people with the most power to alter this system were the ones who threw the most extravagant events. Everyone liked to say they cared about recycling and wasting less. Few wanted to take responsibility for it. I worked my final sanit shift last summer and the job has left me with more than just an undying enthusiasm for trash. I can still feel where my nose broke from the time I fell pushing a bucket of food scraps too fast, or the spot on my left foot where boiling water created a gummy worm-sized blister. Yet these minor injuries are nothing compared to the difficult conditions that make waste collection one of the most dangerous occupations in the country. As a staff reporter for an industry trade publication, I now think about waste issues far beyond New York and have come to learn about the global infrastructure that supports our system of stuff. I’ve seen the facility in Maine where my recycling went as a kid, seen where it goes now in Boston, and talked to some of the people who decide what happens to it on a national scale. While I know a lot more about controlling emissions at waste-to-energy facilities or regulating biosolids from anaerobic digesters than I did a couple years ago, I’m still far from an expert. I’ve gained a much deeper appreciation for all the technical and economic factors behind the international waste industry. When friends ask me whether something is recyclable, I’m more apt to go down a rabbit hole about commodity prices or talk about the many forms of extended producer responsibility than give them a straight answer. Wherever I go now—out to eat, on vacation, or even my sister’s wedding—I can’t stop seeing our underlying network of trash. The next time you walk by a pile of bags on the curb, take a minute to think about how they got there and where they’re going. After that, I bet you won’t be able to stop seeing it either. Cole Rosengren is a staff reporter for Waste Dive.